A gear can be defined in terms of its pitch, pressure angle and number of teeth. The metric standards measure pitch as the module. A 1 module gear has 1 tooth for every mm of pitch circle diameter. Thus a 48 tooth, 1 mod gear has a pitch circle diameter of 48mm (1 * 48). Similarly, a 0.3 mod gear having 60 teeth will have a PCD of 18mm (0.3 *60). If you prefer working in DP then use inches and divide by DP instead of multiplying by module. For example a 20DP, 50 tooth gear has a PCD of 2.5in. Where no units are given, you can multiply by your chosen module to get millimeters or divide by your chosen DP to get inches. The pitch circle diameter (PCD) is the distance between the gear center and the point of contact with a meshing gear. At that point, the teeth and the gaps are the same width (1.5708*mod). The part of the gear that pokes out beyond the PCD is the addendum of the tooth. It will be equal in height to the module (ie 1mm for a 1 mod gear). the dedendum is the distance from the PCD to the root of the teeth. It is bigger than the addendum to allow for some clearance at the root. For gears finer tham 1.25mod, the dedendum should be 1.4mod. This give the whole depth of a tooth as 2.25mod (for a coarse gears). An infinitely large gear has rack form teeth which still follow the rules just given. It should be clear that the linear pitch of this gear will be 3.1416*mod. Also, the included angle for the teeth (and gaps) will be twice the pressure angle. 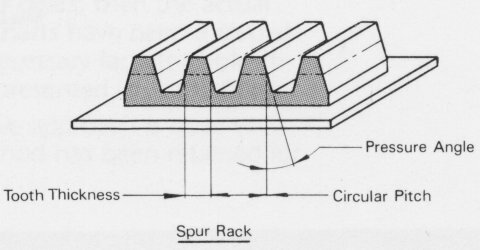 This rack is important for the way you make a hobbing cutter as you use it to get the critical dimensions of the cutter. However, it is important to realise that it is not the shape of your cutter. Rather, it is the shape that will be left by your cutter. Imagine you were using a hobbing cutter to create a rack. The cutter must leave behind the rack shape. It cannot do that if the cutter is also rack shaped because of the different heights of the addendum and dedendum. So the cutter must be the ‘opposite’ of the rack shown above. The question is, how far into the blank do we need to cut the grooves? the cutter must remove material to a depth of 2.25mod. 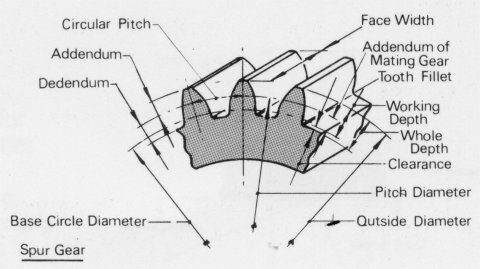 If we dont want to make a topping cutter that also forms the gear tooth tops, we can make the cutter teeth deeper and regulate our depth of cut when making the gear. The hobbing cutter will be made with a tool shaped like a thread cutting tool, in much the same way that we make a thread. the included angle of the tool will be twice the pessure angle (20 degrees is common). Just as when you grind a thread cutting tool, it is very difficult to know exactly what the tip radius might be. The safest bet is to grind the tool with a sharp tip and hope it stays pointed enough for the job so that we can index accurately from it. Since only six cuts are needed to make this hob, you have a fighting chance. With a 40 degree tool, the greatest depth you could cut would be 4.32mm – that would leave you with pointy crests and roots. halfway down that, at 2.16mm would be the line where the teeth and the gaps are the same size. That corresponds to the chordal thickness line or PCD of the gears. 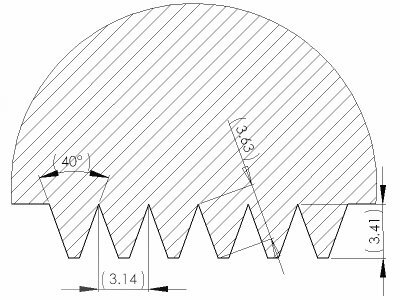 Our cutter must remove 1.25 * mod depth of material below the chordal thickness line so our total infeed needs to be (2.16 + 1.25) = 3.41 * mod leaving us with neat, flat crests. Any radius on the tool that does this will change the depth of cut, reducing it by some amount. Before fluting your cutter, you should look to see how well it meshes with a known good gear. If it is correct, there will be a good amount of clearance between the gear and the hob at the root of the hob teeth but none at the tips of the hob teeth, indicating that the hob could remove all the unwantend material from your gear. If you wish to set over the top slide and feed in at an angle, set it at a bit less than the pressure angle and, for 20 degrees, increase the infeed by only 6% (Really, that is all that you need since 1/cos(20) = 1.064).